it’s one of the most important weekends of the year for many Christians! Resurrection Sunday begins bright and early at the cross at Albany Hill Park, with the Sunrise Service at 7 AM! This ecumenical community gathering is once again sponsored by the Lions Club and led by Solano Community Church. 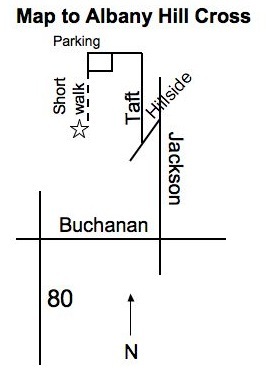 Meet at the cross at the top of the hill; Albany Hill Park is accessible from the Buchanan Street exit on I-80 or from San Pablo Ave at Marin Ave. See attached image for a map. Note: sturdy walking shoes are a good idea, as the walk to the cross is a bit steep and may be muddy! Then, folks will be at BFC beginning around 8:30 AM for coffee, bagels and fellowship. The Singing Ensemble will rehearse at 9 AM. Our regular Sunday School classes for children and adults will gather at 10 AM (note: the adult class will meet in the fellowship hall and the Quakerism class in the pastor’s office). Then in our worship time at 11 AM, we will celebrate with lots of music, including a new hymn taught by the children and a Singing Ensemble selection, along with reflecting on the mystery of Jesus’ rising again in waiting worship and prayer. There will be fellowship time afterward, for as long as Friends would like. Please join us, in the hope and the power of the Resurrection!